Four horn players summoned the start to the grand return of Fleet Foxes last night at the Greek Theatre — the band’s first East Bay show since its six-year hiatus came to a close with 2017’s Crack-Up. Wordlessly, the indie folk band launched into the album’s shape-shifting, meandering six-minute opener, "I Am All That I Need/Arroyo Seco/Thumbprint Scar." It represents the new record well: at once introspective and expansive; complex, cinematic, and compelling. Before writing it, Fleet Foxes frontman Robin Pecknold withdrew from the public eye and enrolled at Columbia University following the departure of Fleet Foxes drummer Josh Tillman, now the famously flamboyant and sarcastic Father John Misty. It received wide and deserved critical acclaim. Still, most Fleet Foxes fans were converted back in 2008 with the band’s hit self-titled debut. Despite the new work's remarkable instrumentation — dancing flute, bowed guitar, somber cello — and unusual, proggy song structures, it was easy to sense that the audience cared significantly less about Crack-Up than the band’s earlier, melodic sing-alongs. So, Fleet Foxes played the hits. The bulk of the band’s lengthy, one hour-and-45 minute set stemmed from Fleet Foxes, Helplessness Blues, and even the group’s first EP, Sun Giant. After the band kicked off the set with a series of tracks off Crack-Up, Pecknold paused to praise the setting: "This is the most beautiful theater in the most beautiful part of the most beautiful country," he said. Then, someone in the crowd asked what kind of tea he was sipping during breaks. "Who said it was tea? How high is everybody? We didn’t even need to bring the smoke machines today," he laughed. Indeed, a thick cloud already rested over the theater from folks celebrating 4/20. 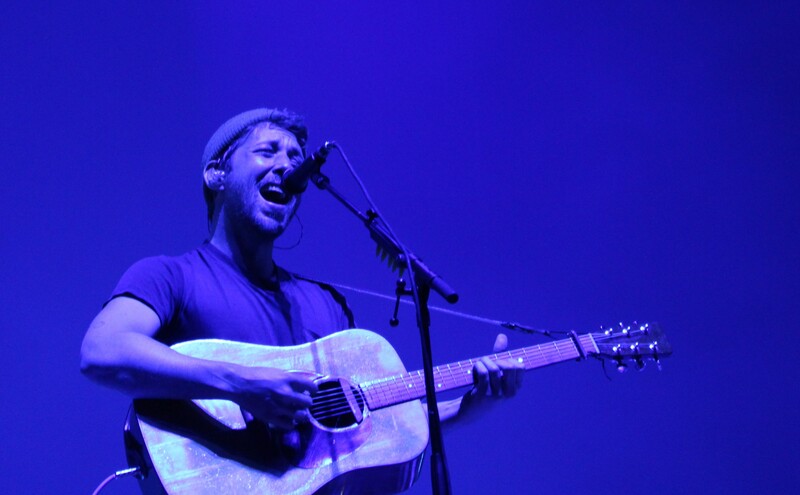 Quickly, Fleet Foxes jumped into the harmony-rich pop ditty "Ragged Wood," and the crowd erupted in joy, and that set the tone for the evening. Toward the end of the set, though, Fleet Foxes returned to Crack-Up and all its frantic trombone, jazzy breakdowns, and drama — so much so that the last moments finished quietly, feeling slightly anticlimactic. That was fixed, though, when the band came back for a hit-filled encore, including two songs that saw Pecknold playing solo, allowing his powerful vocals to envelop the whole venue. The first number, "Meadowlarks" from Fleet Foxes, was a special request from a fan in the audience who had apparently gotten out of brain surgery four days prior but still came out to the show. Pecknold said he had only played the song "like, once" live before, and apologized, but as with the rest of the set, he performed it beautifully.